Sweets are an indispensable part of our Indian culture, they are shared at all times – not only on festive occasions but in day-to-day life. It could be as small a reason as getting a good job or a good grade, or a big reason like getting engaged or buying a new house. Indian sweets form an integral part of any celebration or festival as well. The long preparation hours, lots of interesting ingredients, the toil associated, etc. make them yummy, enlivening the spirits. Indian sweets differ to some extent, from one city to the other, also influenced by other cuisines in the world particularly those from the Southeast Asia. Fascinatingly, sweet as a part of daily Indian life is but a tiny parcel of a whole. Indian sweets and vegetarian snacks are undoubtedly, more than just aromatic, savory concoctions that satiate your palate. No good news is complete without offering of sweets. In every festival, ritual or occasion, in India, it is essential to make sweets as a part of the meal. Sweets in India thus, signify prosperity, happiness and affection. To celebrate such love and affection of our sweets, I have started with this event “ Lets Celebrate – Indian Sweets”. Only Indian sweets are allowed, any cuisine, any course. Both archived and new entries are welcome. Please leave me a note if you are unable to do so, and I will link it for you. Non-bloggers please send me the recipe at nupurs.kitchen@gmail.com and I shall update it for you. « Eggless No Fat Pineapple Cake.. Well ! Mini Bakes really ..
thanks for hosting Nupur. just added mine. 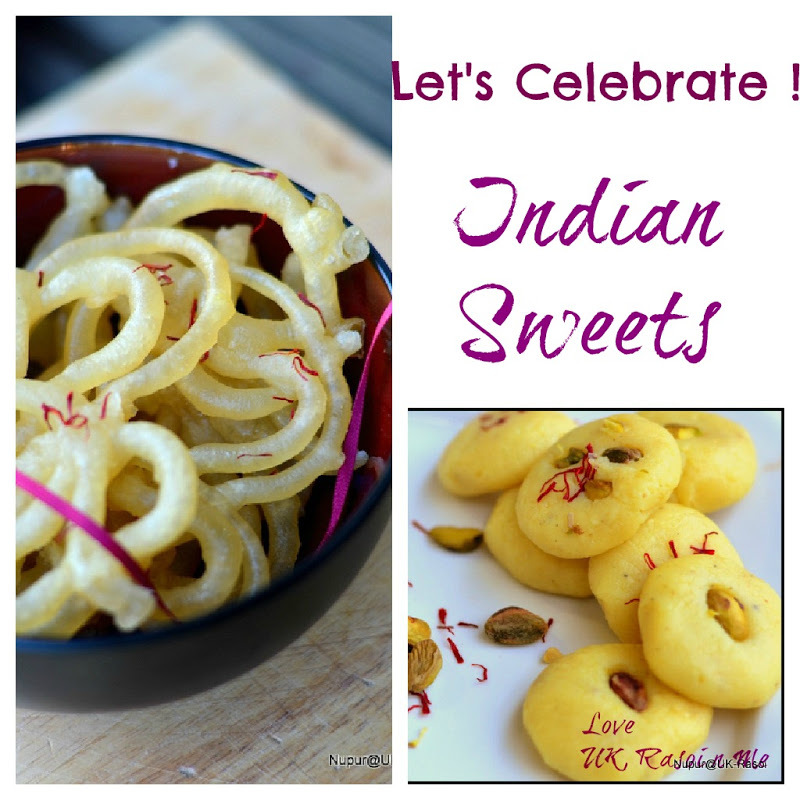 Hey Nupur….linked up my Jalebi recipe here….I have similar event for Diwali and my space too….if you would like link up your recipes too…. Great contest for the festive season Nupur:). Keep up the good work !! There are many Indian delicious and traditional sweets available online. Now a day if any people want to send sweets online to their beloved one or families. They generally do online order of the sweets. I have found Exotica Bazaar is the good portal to give wonderful services. There are many such sweets varities like Plain Dry Petha, Meetaaz, Gur Rewari, Sandwitch Petha, Besan laddu, Mysore Pak, Balushahi, Peda, Pista Rewri, Kalakand, Sweet Khaja, Gajjak Gur Shalimar and many more Indian Traditional Sweets. Thanks UK Rasoi for wonderful events. India is a country of festival and sweets is the best thing that can you give to your relatives and frineds ,kids. Thanks for sharing. My frineds send me Best Indian Sweets in festival. I will definetly suggest this.